The New York Times posted a story about Charles Lynch on their website on April 8, 2015. The story should also appear the next day, April 9, 2015 in print. New York Times National Correspondent Erik Eckholm personally traveled from New York to Lynch's home in Farmington New Mexico where the two sat down and talked about the 2015 Federal Spending Bill Section 538 and how it may affect Lynch's Federal Appeals Case. Lynch goes into his eighth year of prosecution for operating a City Sanctioned Medical Marijuana Dispensary in Morro Bay California in 2007. During the interview Erik asked Lynch questions about his days as a Medical Marijuana Dispensary owner in Morro Bay California. Lynch reminisced and showed some historical documents from the business as a professional photographer, Mark Holm, snapped up photos with his telescopic lenses. Erik asked Charlie how it feels to be prosecuted for eight years and other questions without real answers. After the interview Erik and Mark picked up guitars and Jammed a few tunes with Charlie and his Microband. They played some Neil young and other popular music together. Erik and Mark also met with Lynch's family members and a photo shoot wrapped up the two day event. If Lynch's Section 538 motion to the 9th circuit court of appeals succeeds as the Government fears, Lynch's case will set a legal precedent for the 9th District States and possibly the entire nation. 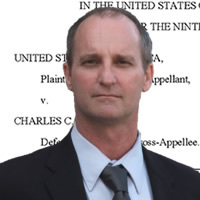 Federal Medical Marijuana Defendant Charles Lynch, who's prosecution for operating a city sanctioned medical marijuana facility in California goes into the eighth year, has filed a motion in the 9th Circuit Court of Appeals based on the new Federal spending bill which cuts Federal funding for medical marijuana prosecutions in Medical Marijuana states such as California. Lynch's motion asserts that Federal Prosecutors are now in violation of section 538 of the 2015 spending bill by continuing the Federal Prosecution pertaining to Lynch's medical marijuana dispensary. Lynch's motion was filed by his Federal Public Defenders on February 24, 2015. Charles C. Lynch has been recognized in the World's greatest online Encyclopedia, Wikipedia. Click here to see Charlie's Wikipedia page.